Since the 19th Century, Siriraj hospital has been established as the first ‘western' medical centre in the Kingdom of Thailand according to the royal legislation and graciousness of King Rama the V of the Chakri Dynasty. 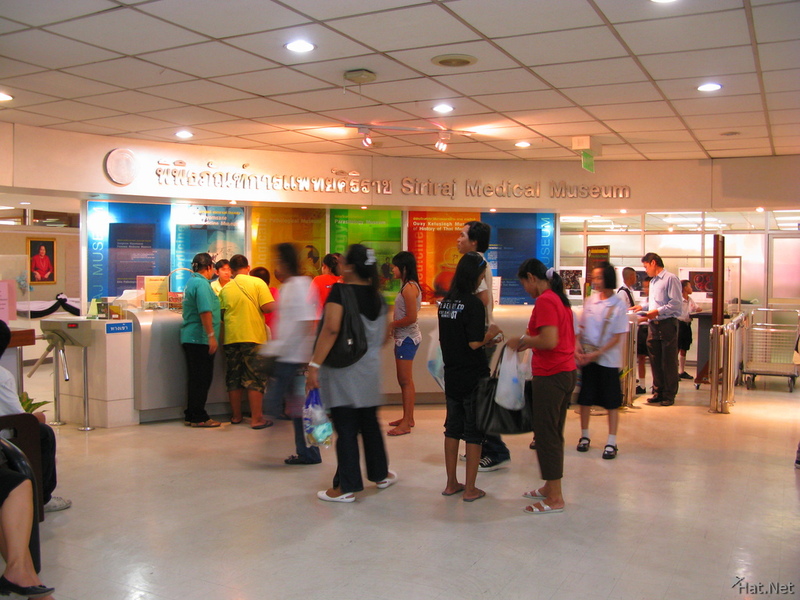 Why Siriraj Medical Museum is special ? Since the 19th Century, Siriraj hospital has been established as the first ‘western' medical centre in the Kingdom of Thailand according to the royal legislation and graciousness of King Rama the V of the Chakri Dynasty. Siriraj hospital is also the first medical college of Thailand to train medical doctors and nurses for more than a century. Several significant contributions in nearly every aspects of medical care and public health with support from large number of Siriraj alumnists have brought trust and respect at national and international levels to this hospital. This visit was very interesting, although definitely not for the squeamish! You can view all sorts of body parts and other things, like skulls of people that have been shot in the head. It is all rather morbidly fascinating!There are also lots of deformed babies, like twins with one head or joined at the chest and other abnormal growths.You get to see what the inside of your body looks like and also what it looks like if you abuse your body with alcohol or smoking.The museum is divided up into sections. Pathology, Anatomical, Forensic, Parasitology and so on.All in all a very interesting visit.To get there take the ferry at the central pier to pier number 10 (Prannok Pier) and follow the signs.Entrance fee is 200 baht, with an extra 200 baht for headphones if you want some of the things explained in English (everything is in Thai). This museum is dated back more than 4 decades, now just renovated and combined as part of new medical exploring museums.Come from Banglumpu/ Khao Sarn area?Catch the bus 157 from democracy monument heading to Bangkae!Come from Siam/ Downtown Shopping centers or Silom/ FinNcial district?Catch the bus 177 as this one will run in circle!Come from Grand Palace?Cruise the ferries crossing the river to SIRIRAJ HISPITAL!Once you arrived, ask for direction from medical staff may be excellent choice, but if none try ask locals by the keyword: SEE OUI (pronounce in English - NOT French! )Don't forget to pay SEE OUI a visit and exploring such horrific history!